Continuity mistake: Masterson spits on the glass while Frank talks to him. The spit pattern changes at least once during the scene. Check the lines running down the glass. 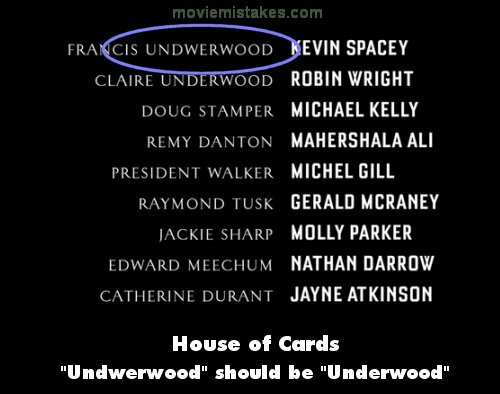 Other mistake: In the end credits, "Frank Underwood" is misspelled as "Frank Undwerwood." Continuity mistake: When Frank and Gene Clancy are at Oren Chase's house, Oren ends the conversation by taking a sip of his ice tea. When he first grabs the glass, he grabs it by the top. In the next shot, he's holding it by the middle. And in the following shot, he's holding it at the top again. 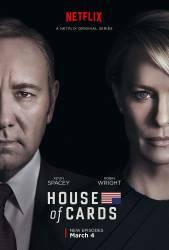 Frank Underwood: From the lion's den to a pack of wolves. When you're fresh meat: kill, and throw them something fresher.